There is a lot of confusing – and often contradictory – information about the Ebola virus circulating. Hopefully this Q&A will clear things up. A: Ebola was discovered in 1976, during the first known human outbreaks – one in northern Zaire (now Democratic Republic of the Congo) in Central Africa: and the other, in southern Sudan (now South Sudan). The virus is named after the Ebola River. The Zaire outbreak killed 280 people (88% fatality rate). The Sudan outbreak killed 151 (53% fatality rate). Those numbers are for reported cases. One person in England was infected with the Sudan subtype – that infection occurred via an accidental needle stick in a lab. That person survived. Professor Peter Piot, the Director of the London School of Hygiene and Tropical Medicine, was on the team that discovered Ebola. In a recent interview with The Guardian, Dr. Piot explained that the virus was discovered when a blood sample was brought to his lab in Belgium, with a request to test it for yellow fever. Using an electron microscope, he created an image of the virus and noticed it looked similar to the extremely dangerous Marburg virus, which causes a hemorrhagic fever. A short time later, the American Centres for Disease Control determined that it wasn’t the Marburg virus, but a related, unknown virus. The Ebola virus itself isn’t what kills people – the immune system’s reaction does. For more on that, please read Ebola: How it Kills May Surprise You. A 2007 study showed that the Ebola virus CAN be transmitted via fomites (inanimate objects like clothing, sheets, soap, furniture, or countertops, that are capable of transmitting infectious organisms from one person to another). That study found that the risk is low when infection control guidelines are followed. The CDC has NOT been consistent about the possibility of Ebola transmission via fomites. Their own bulletins have been contradictory. For a lot more detail about this issue, please read Even the CDC Isn’t Totally Sold on its Own Proclamations on How Ebola Is Transmitted. Transmission through heavily contaminated fomites is apparently possible (source). The virus can also be transmitted through material heavily contaminated with such fluids (source). The risk of infection is higher in the later stages of the disease. The sicker the person, the more infectious they are. Corpses carry the highest risk. In West African countries, burial rituals involve close contact with the dead. 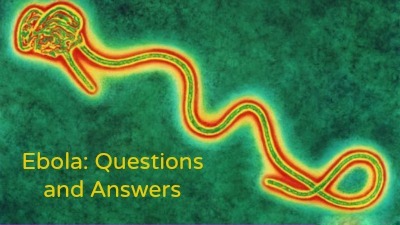 Regarding airborne transmission: There has been a LOT of confusion about the possibility of Ebola virus being airborne. Some experts say it is NOT transmissible via airborne particles. Some say it MIGHT be. Still others say it MAY become airborne if it keeps spreading and mutating. A: As of September 28, 2014, 377 healthcare workers have been infected with Ebola (during the current outbreak). Of those, 216 have died, according to the World Health Organization (WHO). But a lack of resources, under-staffing, poor protection, and unsanitary conditions are huge issues in the West African countries affected by Ebola. They are simply overwhelmed by the magnitude of the outbreak. Jon Cohen of Science Insider interviewed two healthcare workers who survived Ebola infection. He asked each how they think they became infected. The first is Dr. Senga Omeonga, who became infected while working in Liberia. He told Cohen that a lack of protective equipment, patients lying about symptoms, and inadequate protective gear are possible reasons. The second healthcare worker Cohen interviewed was Nancy Writebol, a clinical nurse associate from the US who worked with the missionary group SIM in Liberia. Dr. Kent Brantly, who worked in Liberia, does not know how he contracted Ebola either. He said he is sure he didn’t violate any safety guidelines. Dr. Rick Sacra, another American doctor who caught the virus in Liberia, did not treat Ebola patients. He worked in the obstetrics ward, which is separate from the Ebola isolation unit, and followed all safety precautions (including wearing protective gear). In other words, it is possible for an Ebola test to be negative when the person actually does have Ebola. Rapid tests that show results IMMEDIATELY have been developed, but have yet to be approved for use. Dr. Sacra was not given ZMapp – he was given an experimental Tekmira Pharmaceuticals drug called TKM-Ebola for a week after he arrived in the US for treatment. Dr. Sacra also received two blood transfusions from Dr. Brantly. These blood transfusions are believed to help a patient fight off the Ebola virus because the survivor’s blood carries antibodies for the disease. Dr. Brantly also received blood from a recovered patient. At recent WHO meeting, over 200 experts agreed that convalescent blood and plasma therapies (using blood from Ebola survivors) should be prioritized as a treatment option to consider. This method was used during the 1995 Ebola outbreak in Kikwit, Democratic Republic of Congo. Whole blood collected from recovered patients was given to eight patients. Seven of the eight recovered. Dr. Brantly, Dr. Sacra, and an unnamed foreign doctor were treated with convalescent blood, and all three recovered. A: People who recover from Ebola infection develop antibodies that last for at least 10 years, possibly longer. It isn’t known if people who recover are immune for life or if they can become infected with a different species of Ebola. Some people who have recovered from Ebola have developed long-term complications, such as joint and vision problems. Are the negative result people listed in your Spread article being retested?